I have three more blocks to place. I can't believe how much I got done today, given that the very hard bit I hit yesterday evening turned out to be larger than I'd hoped, and harder than I thought sand could get. Even soaking it didn't help. But. Little hand adze, a few hours in the hot sun whacking at the stuff, and I'm mostly done. Those three blocks have to go into a spot with more of the hard stuff in it, and my arms would like a break, so they can go in there tomorrow. I've been moving the large discard pile around the garden, building up low areas and that sort of thing. 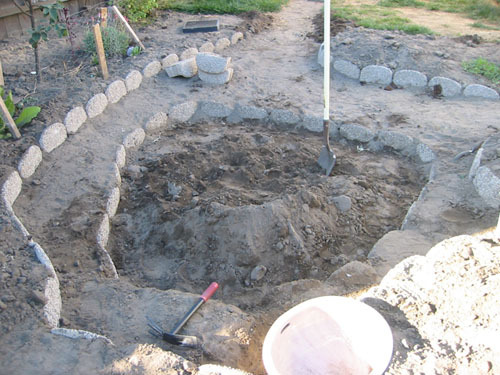 I also built up the beds all around the basin. 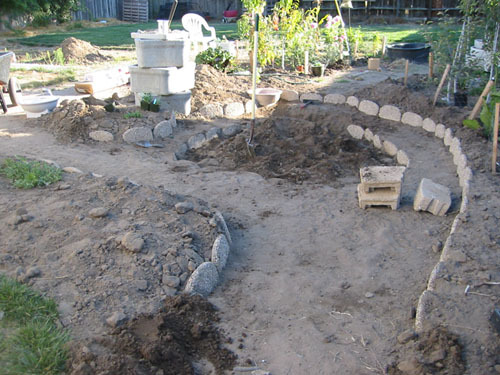 Tomorrow I'm going to finish moving out the discard pile, then transplant the dianthus into the area that looks like a little narrow path around the basin, but is in fact intended as a planting bed. You may ask: is that a sink right there? Yes, it is. A particularly bad pun, to be true, but also a really neat planter. This particular sink was purchased years ago in a fit of fixture-related art, and never used. Now it has a home, where it is saving me from having to go buy two more blocks, because frankly I'm getting tired of that trip. Another task for tomorrow is to build up the soil better in this bed. I ordered some daylilies, and they are arriving on Thursday, so I better be ready for them. 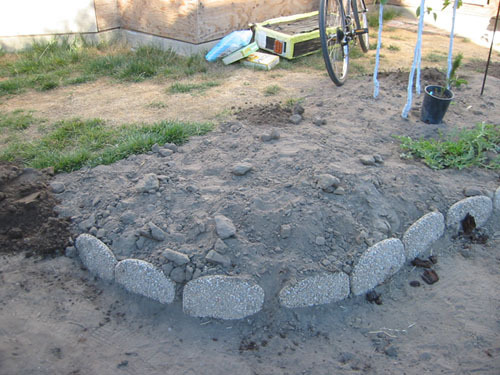 I laid out little clumps of dirt where I'm going to put them: I have three each of three varieties, so it needed some planning. 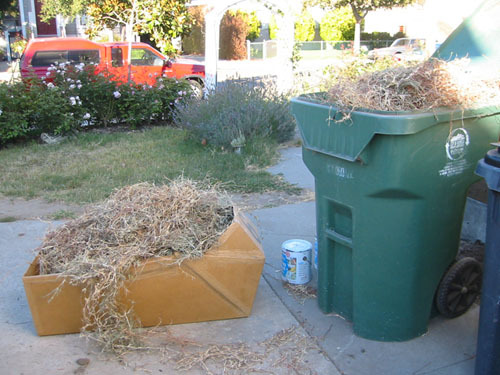 And here's my evidence of my hard weeding work: the city green bin is packed full, and I used my cardboard boat as a sledge to drag the rest of the weeds out. Well, it's not like I'm ever going to use it as a boat again. Alas, the weeds seem to be perfectly happy at this volume, and mushing them down doesn't get me any more room, so I may have to wait until trash day to get the rest of them in there.